We're very lucky and Willow's kindergarten class has "creek walk" once a week. They walk a little over half a mile each way and spend the entire afternoon playing on the banks of the creek with sticks and rocks and sand. A few weeks ago the snack schedule changed and popcorn day started falling on creek day. 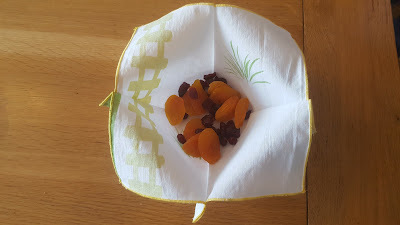 I was sad to see the coffee filters that got used and thrown away each week but kids are too small to control a handful of popcorn on a cloth napkin. I approached the teacher about making some sort of popcorn bags and she offered a bunch of extra cloth napkins that had been made for her classroom for the project. With the hard work already done, I was able to convert twenty napkins into twenty cloth snack bowls in just a couple hours. 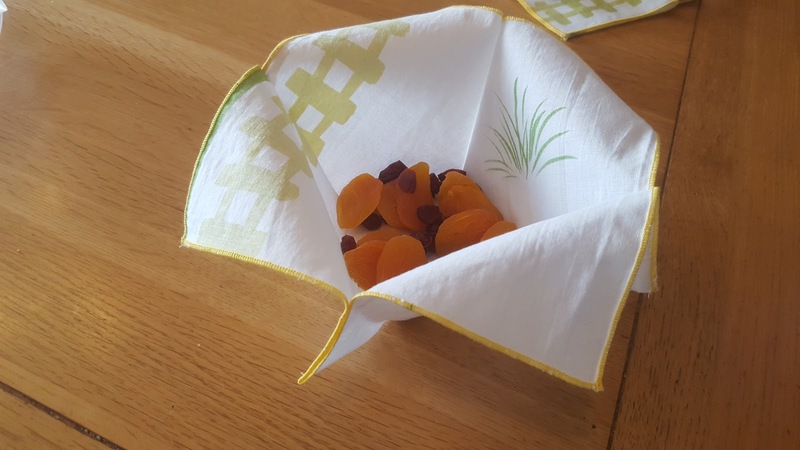 I think they're kind of adorable and might make some for our family for summer outings when I just bring big communal bags of nuts, dried fruit, carrots, etc. 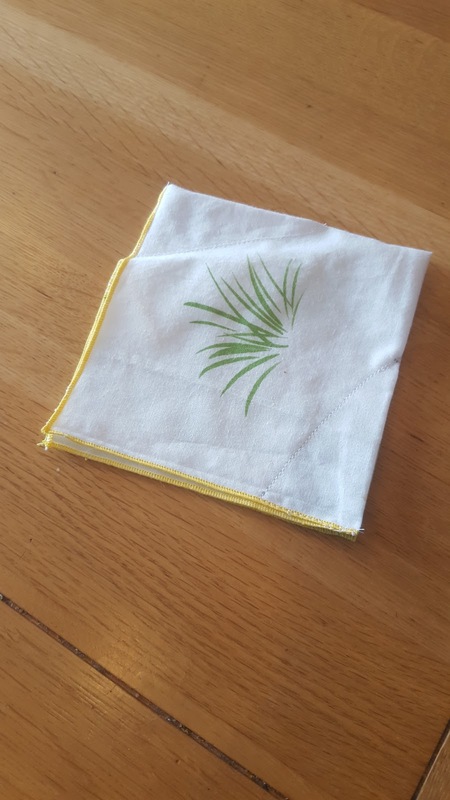 The napkins I was given started out 10" x 10". 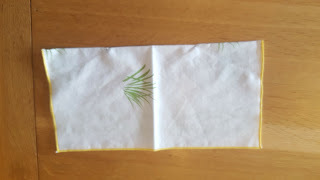 Fold them in half and mark two points at each side - one 3" toward center on the fold and one 1 1/2" down the edge from the fold side. 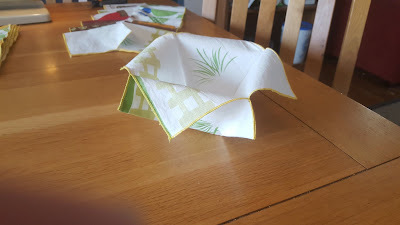 Starting at the edge on the fold, stitch to the 1 1/2" mark then stitch a diagonal line down to the 3" mark on the fold to make a triangle. 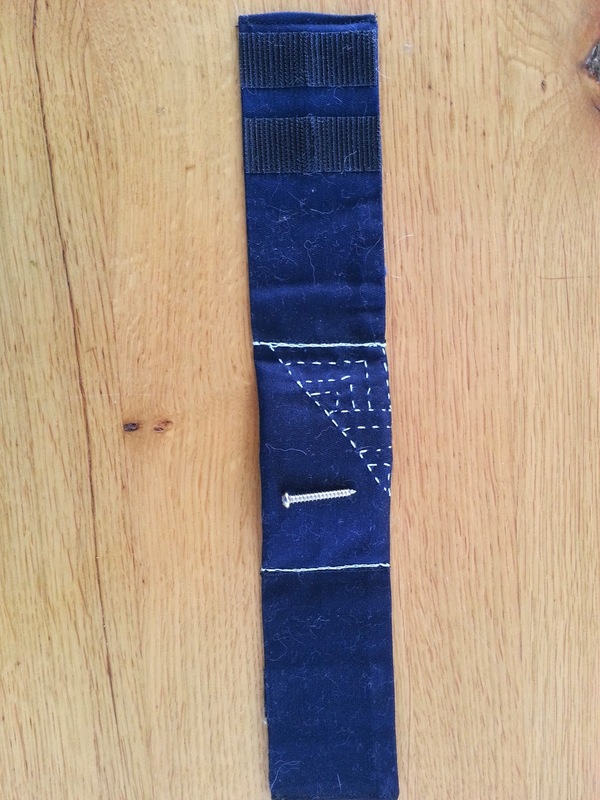 stitched, pull the corners that were both on top together and the ones on the bottom together. 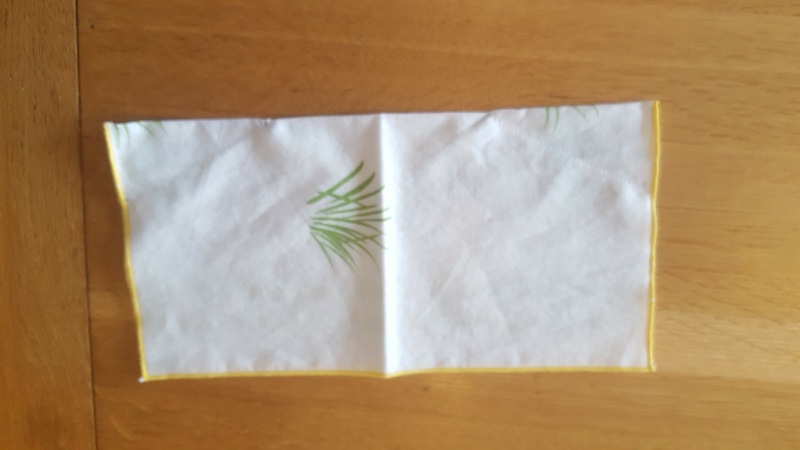 This folds the napkin in half the other way but it will make a gentle V due to the first darts. 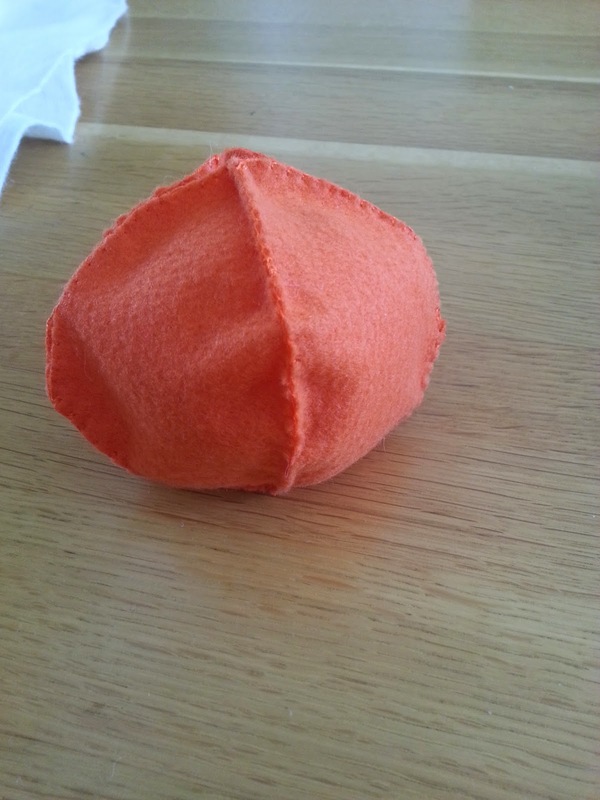 Mark and stitch triangles at the center of the other sides just like you did the first. 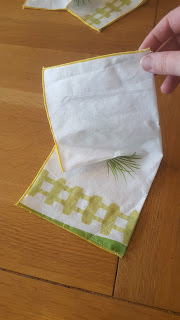 There are now darts sewn in the center of each side of the original napkin. You're done! When it's unfolded, there's a sturdy little bowl for dry snacks but it folds up almost as flat as the original napkin. Welcome! I'm trying to sell some of my excess starts this year to help pay for my seed starting/gardening addiction. 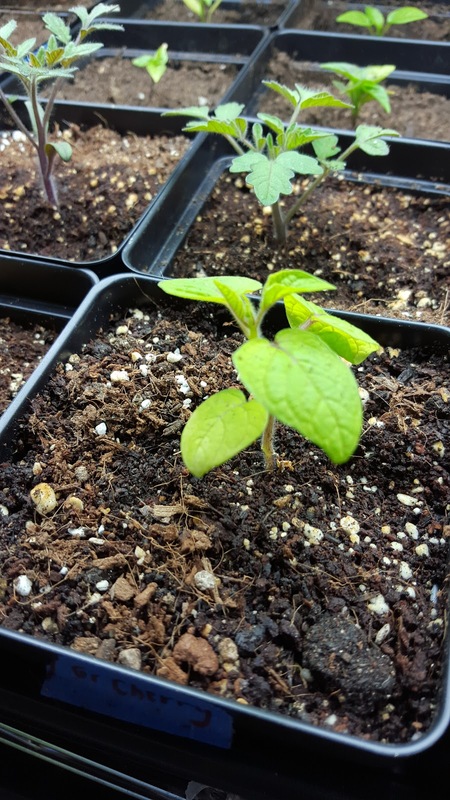 All starts are in 4" pots with organic seed starting mix. 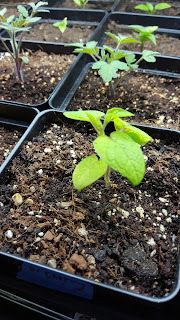 All varieties are heirloom (except the Lambada Bee Balm) and seeds were purchased from high quality suppliers (most from Baker Creek). Email me at lizhartman1@gmail.com to reserve plants and I will update this listing if any varieties sell out. 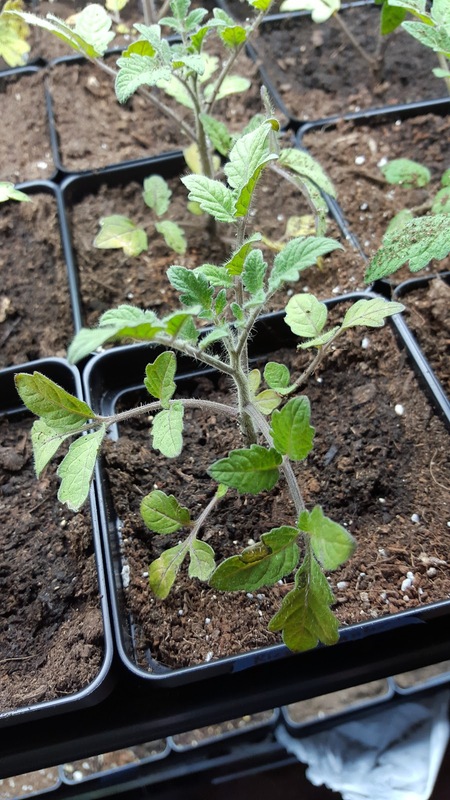 The tomato plants all have several sets of true leaves. 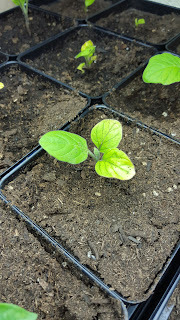 Vegetables currently have 2-3 sets of true leaves (probably many more by pick-up time in three weeks). 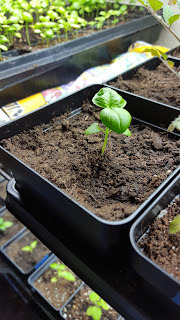 Basil and marigolds currently have 2-3 sets of true leaves (probably many more by pick-up time in three weeks). 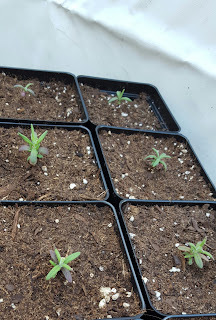 Lavender and rosemary are currently a couple inches tall. 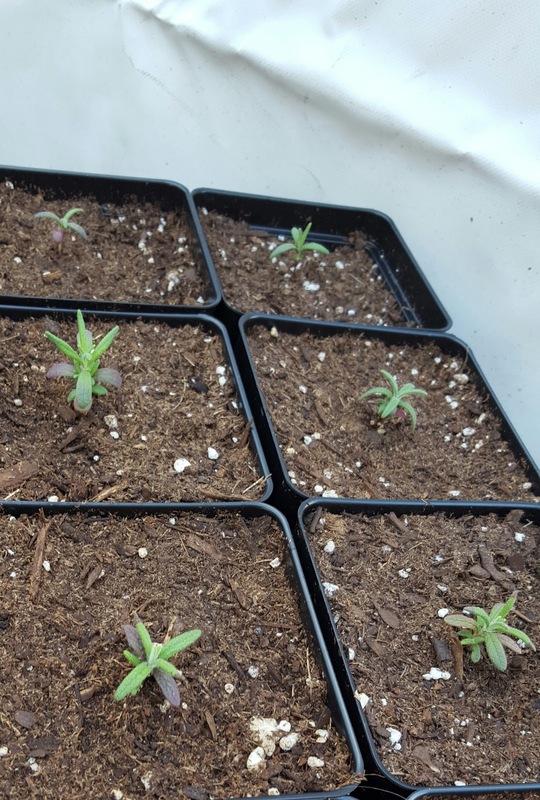 These slow growing perennials would be best as windowsill or patio plants before planting out next spring. Italian Large Leaf Basil - annual herb that produces heavily if flower stalks are pinched off as they begin to form, delicious in pesto, tomato sauce, and so much more. Not a bad ratio, huh? 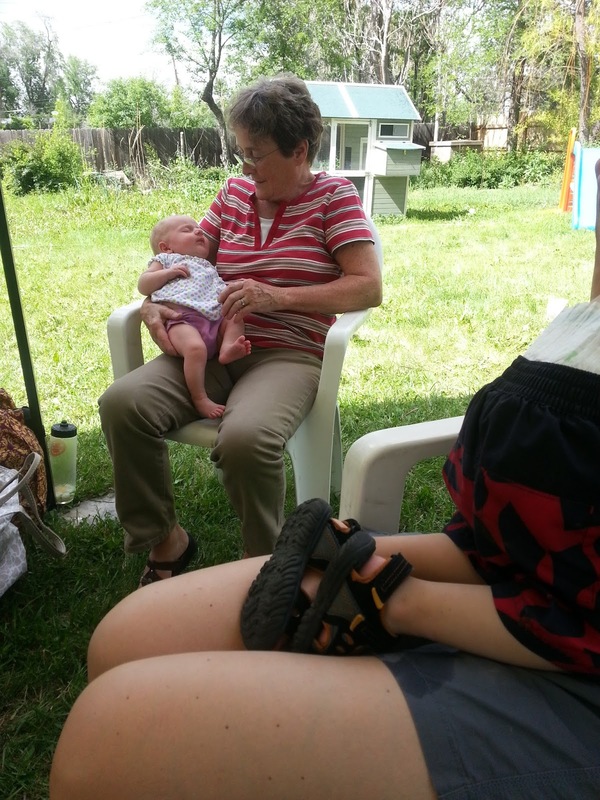 Today was Mom's birthday so we went on the Enchanted Gardens of Northwest Denver Tour (benefiting the Conflict Center) and toured Proctor's Garden (benefiting Denver Dumb Friends League). Clarity spent the day with Daddy and went to the Mini Maker's Faire at DMNS. Since we were going to be out in the sun all day, I started Balsamic Roast Beef Dip Sandwiches in the crockpot in the morning. 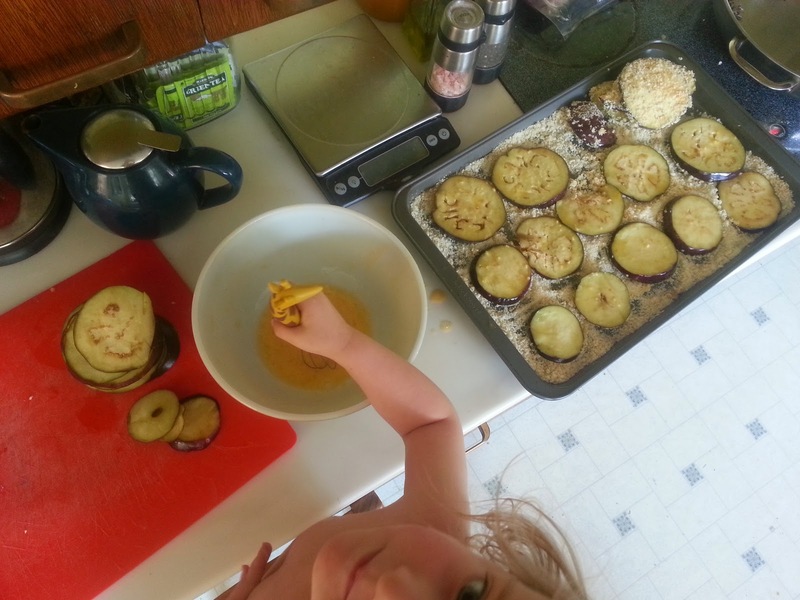 This was a new recipe and is going into the regular rotation. It was extremely good. Now on to the cake - Southern Coconut Cake, also a new (now beloved) recipe. Delicious. 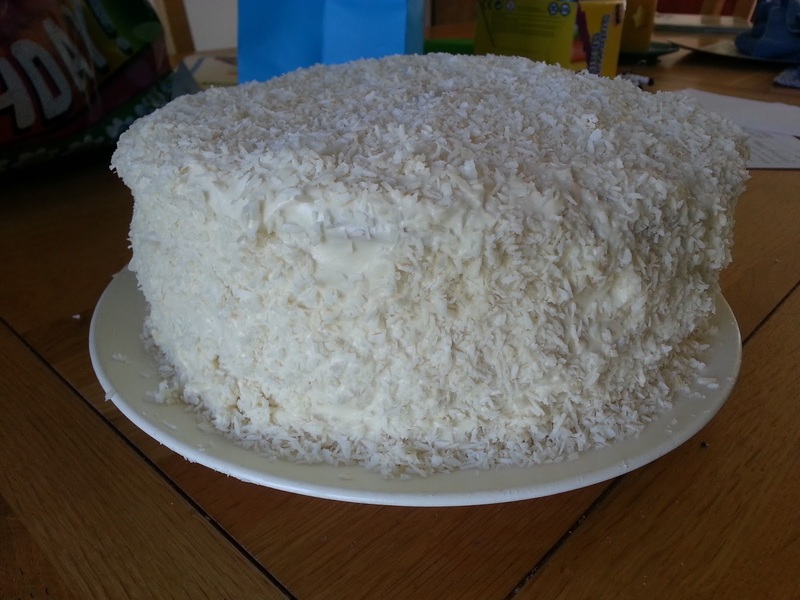 FYI if you try it, I didn't bother to use cake flour and ran out of coconut flavoring. 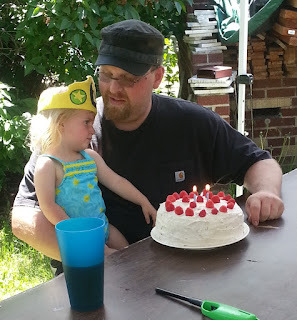 The cake only ended up with 2t and the frosting didn't have any. I did use coconut milk instead of regular milk in the buttercream frosting. Used organic sweetened small flake coconut on the outside and didn't toast it. Still turned out plenty coconutty. 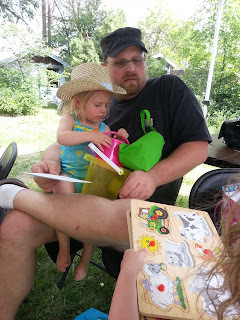 At the end of May, Clarity's 2nd birthday came and we had our "small family get together". Over 20 adults and 8 kids for our family parties now. Love it! 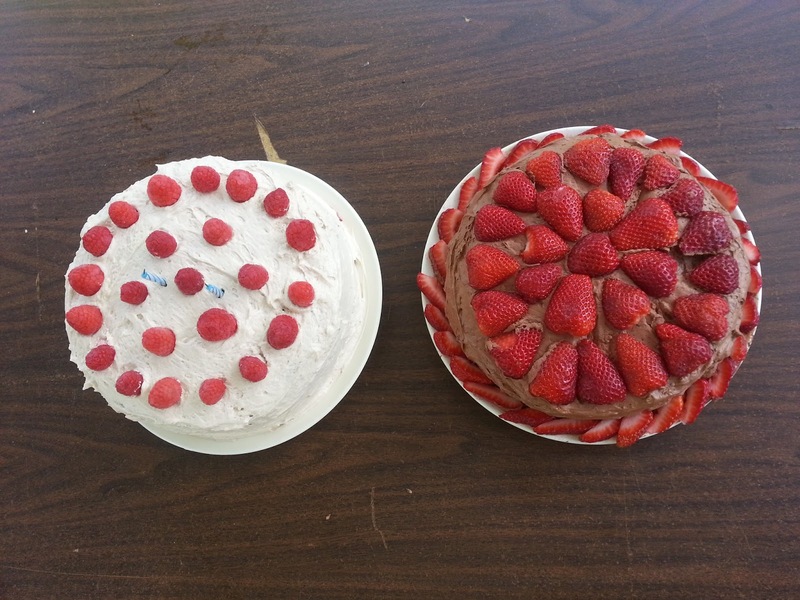 That many people called for two cakes because running out of cake is a birthday disaster. Raspberry-Laced Vanilla Cake has raspberry liqueur in the buttercream frosting instead of milk. This is a very good idea. Chocolate strawberry cake was this frosting (used semisweet chocolate chips) and some random chocolate dump cake recipe. I frosted the bottom layer then added a couple cups of strawberries, lightly mashing about half of them and adding the rest chopped. I frosted the bottom of the second layer before putting it on to keep the cake from soaking up strawberry juice. After frosting the cake, I decorated with some more sliced strawberries. It worked well. 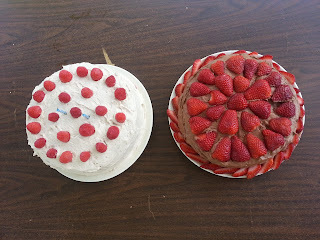 The strawberries were sweet enough without any added sugar and the frosting also wasn't over sweet. 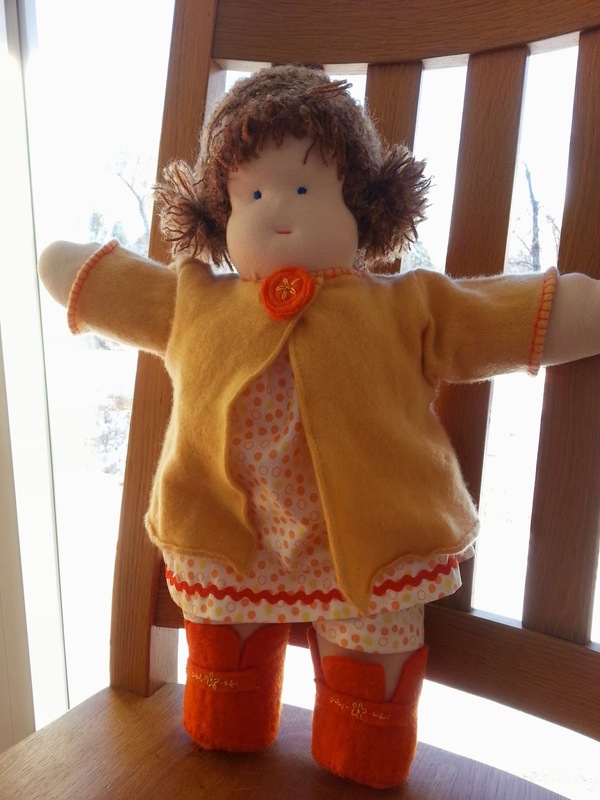 The Denver Waldorf School auction is coming up so I made an 18" dressing doll to donate. 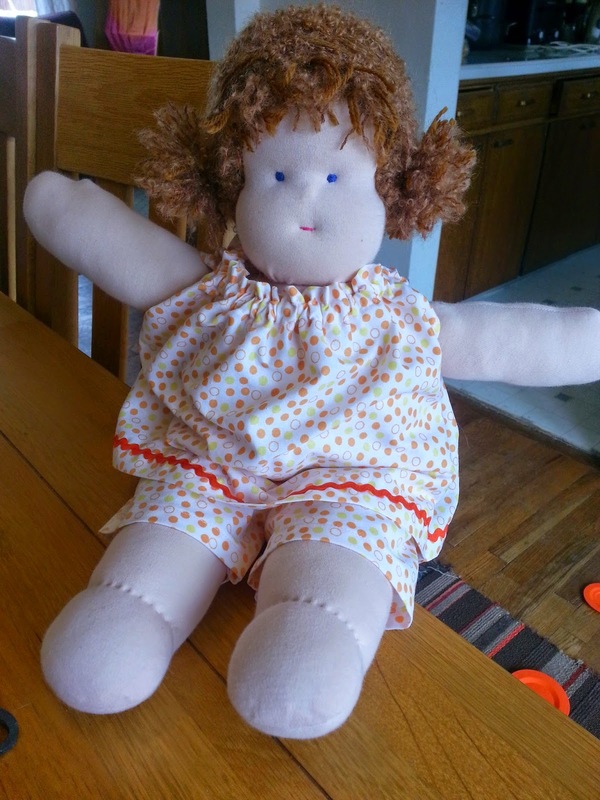 I was making my own pattern and she ended up chubbier than I expected so she reminds me of a mischievous toddler. I'm going to make another soon to try for more elementary age proportions. Her hair is a worsted weight wool yarn and a boucle mixed, pulled through a crochet cap and sewn into two puffy ponytails with bangs. Marigold has a cashmere sweater (upcycled from an old adult sweater), with hand embroidery around the cuffs and collar. 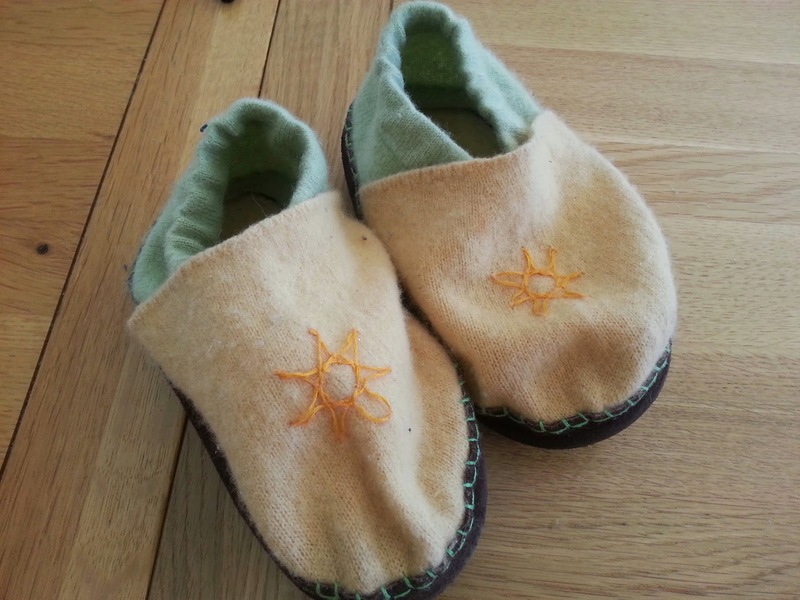 Her wool felt button also has a flower embroidered on it and matches her embroidered wool shoes. A light cotton shirt and shorts have elastic at the neck and waist so she's easy to dress. 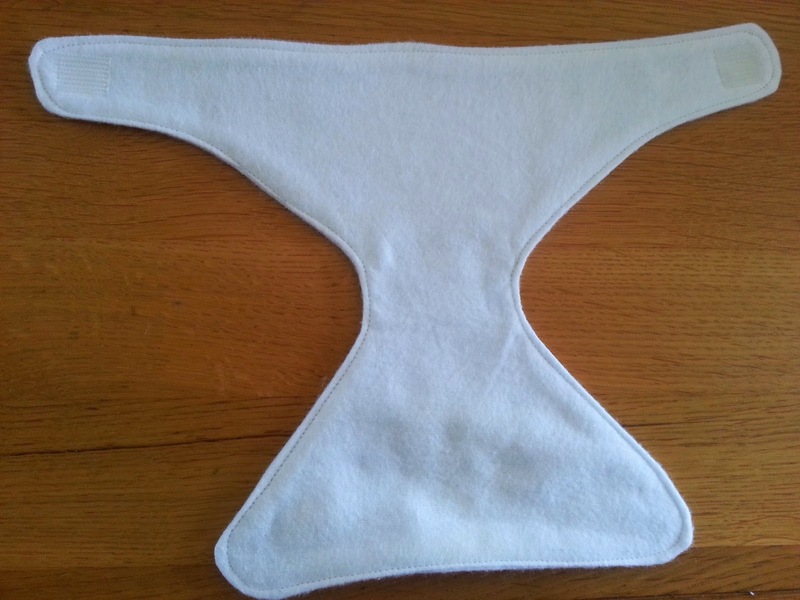 A little freehand design with white flannel and fusible velcro fasteners for her little diaper. I wasn't very inspired this year but was pretty happy with the results of what did get made. An hour on pinterest found lots of felt food ideas to go with the play kitchen my nephew was getting for Christmas. In me fashion, I took the ideas, didn't actually follow much of the how-tos and just went for it. There ended up being a bit of a theme of "fasteners". I was mulling some sort of pea pods with button peas that "pop out" through button holes to continue the theme but didn't get there. The slices were from this tutorial and then I just winged the peel. It closes with velcro. The banana zips into its peel. 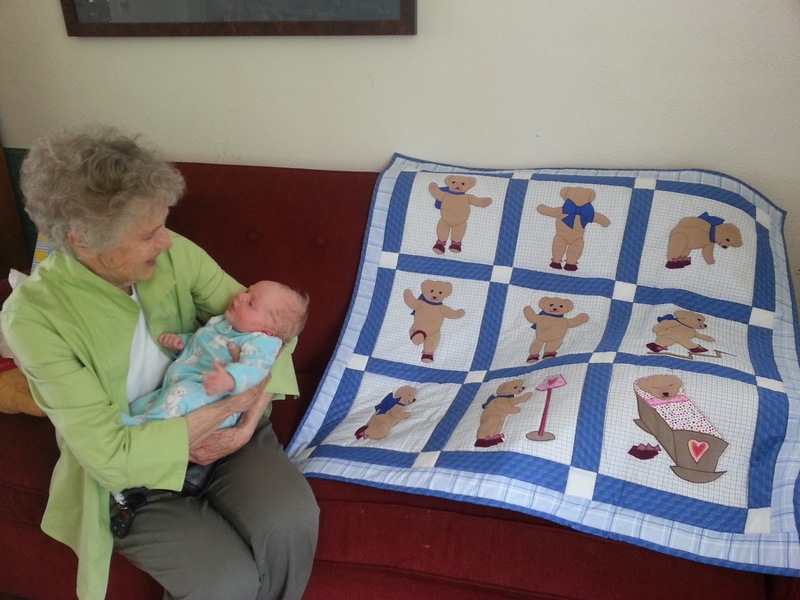 I got to use another of the grandmother's never ending zipper stash. 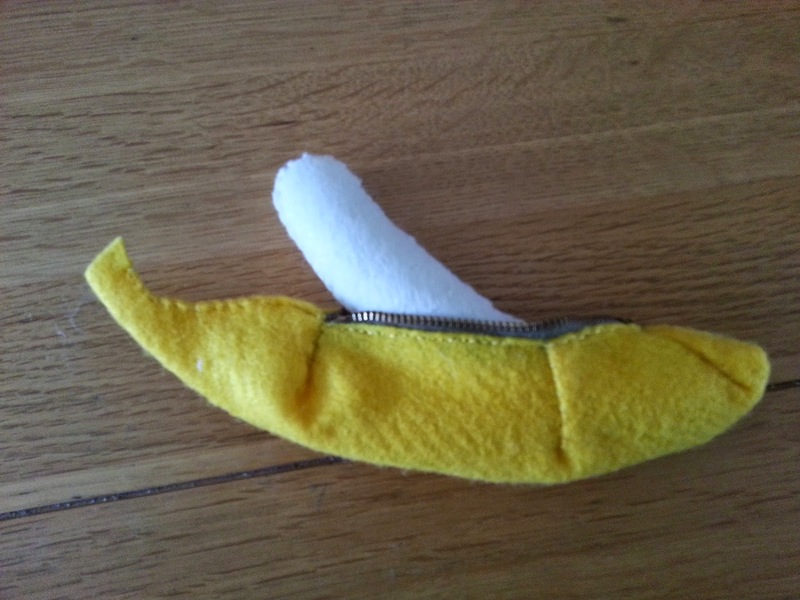 After the banana was made, I just pinned and sewed darts in the peel to get the right shape. Pain in the neck and worth making an actual pattern if I was making more than one but I was happy with the result. 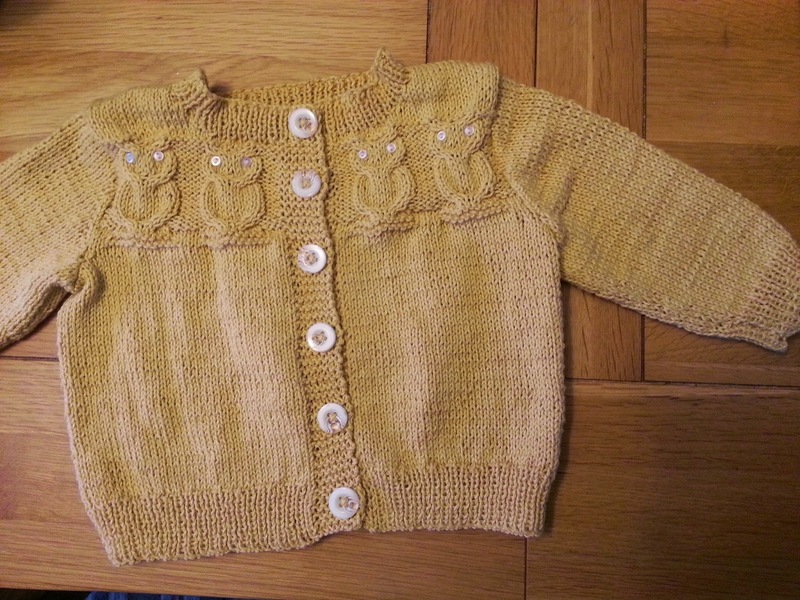 Not for the holidays but a new baby got an owl sweater from Penny Straker's famous pattern. It's been years since I made one of these and it was fun revisiting an old friend. Apparently having a preschooler entails very frequent birthday parties. 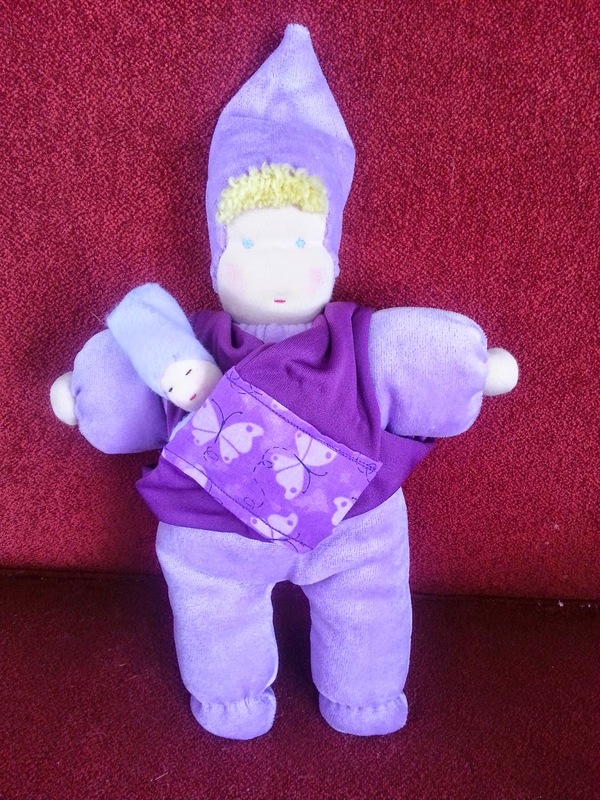 One morning I was lacking a 3 year old birthday gift so a last minute baby carrier was made for one of my cuddle dolls to be a mommy to a jingle baby. Quentin's main gift was a beginning blacksmith class series through Sarqit Outdoor School but I felt that he needed a little something homemade. 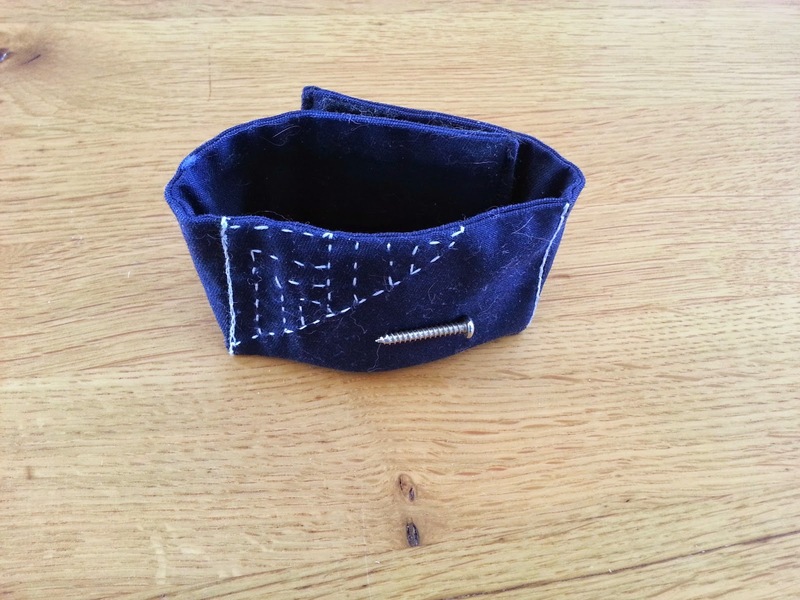 This is a magnetic screw holder bracelet based on this tutorial. (Warning: The author of that DIY rambles a lot and doesn't have sewing experience - which she admits at great length.) I followed the general idea but used just a heavy twill from my stash for the fabric, skipped the rivets, and used fusible velcro instead of sewing it on. Harbor Freight carries the super strong tiny magnets so I didn't have to pay shipping from an online vendor. If you needed 100 of them online would be a better deal but not so much for 10. It's handy we had a pile of vent pipe from the in progress laundry room available for the metal and that Q just bought a nice new set of tin snips. I love the way cutting with tin snips feels, kind of smooth and buttery. I need to find more projects that give me an excuse to use them. 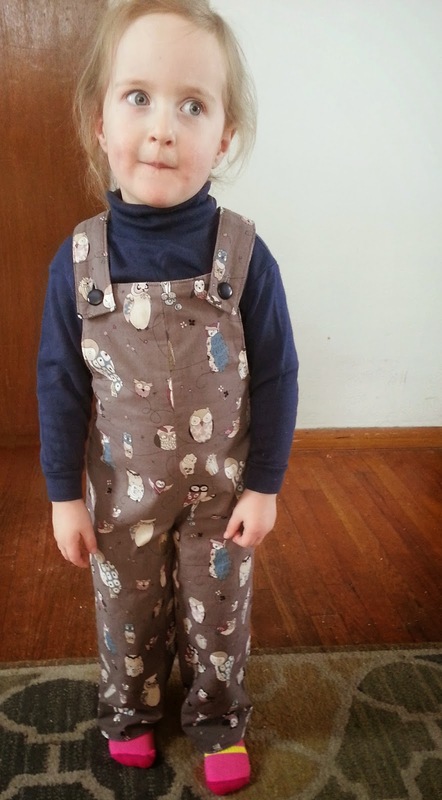 I had the treat of going to a workshop at Fancy Tiger in November to make a pair of reversible Overmost overalls (by Deborah Moebes at Whipstitch). They're fully reversible with the Michael Miller owls on one side and a small wale gray corduroy on the other. 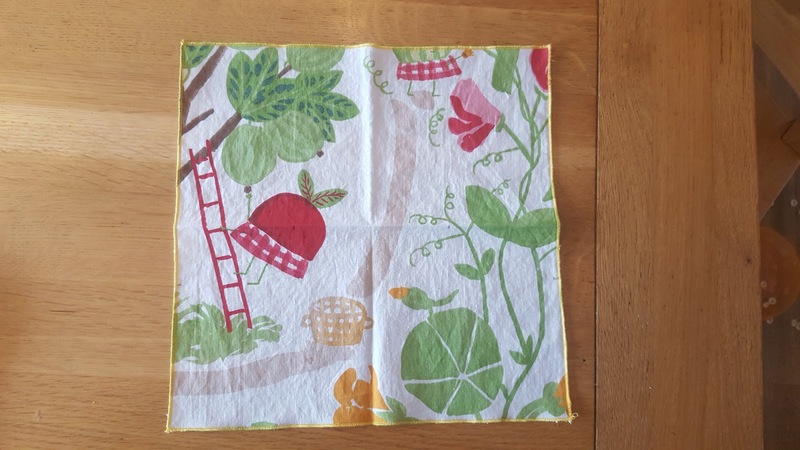 Sewing without any child interruptions for 3 hours was quite the mini-vacation. 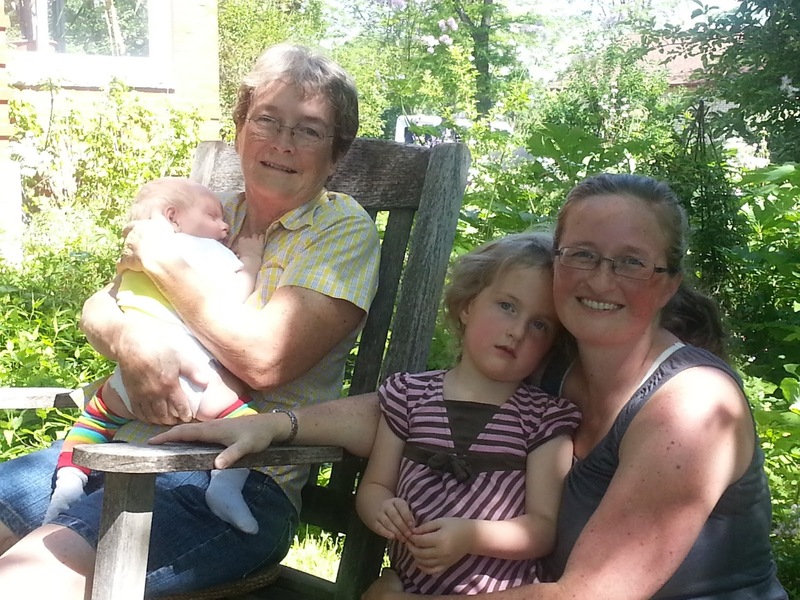 I was also reassured that I haven't truly become less competent but that all those interruptions at home do just sap concentration. Willow needed new indoor slippers. I buy premade sheepskin lined suede soles for these. The uppers are cashmere from thrift store sweaters. 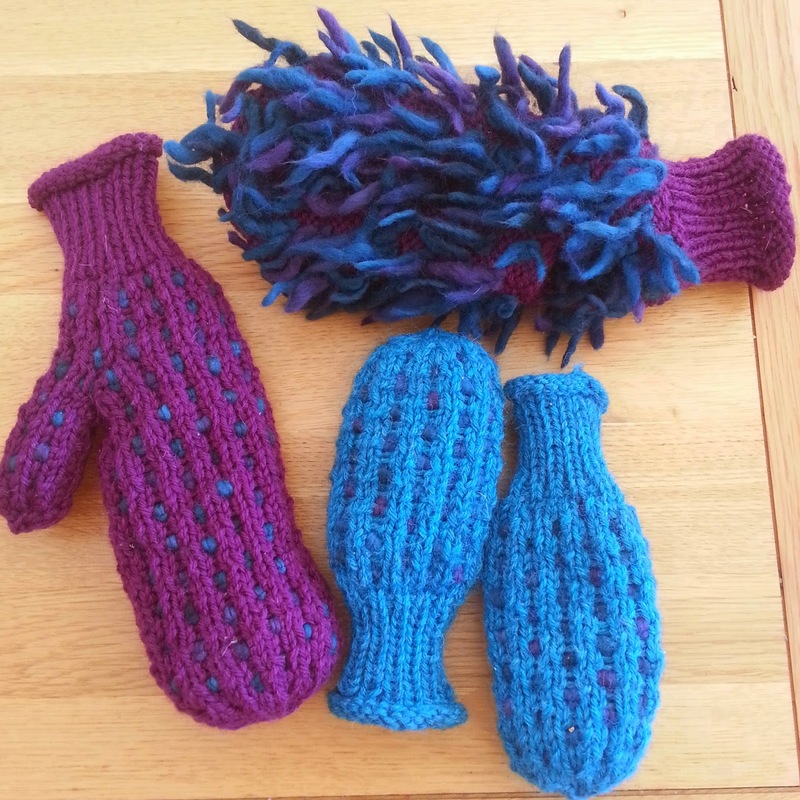 Both girls got thrummed mittens. (One of Willow's is turned inside out in the picture to illustrate what "thrumming" is.) 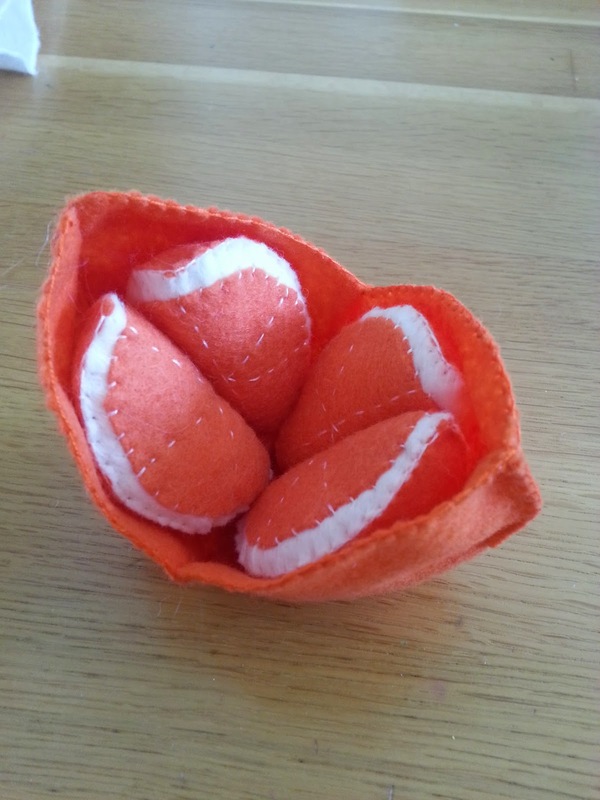 I made a the smallest size in the pattern for Willow and they're still too big for her. I modified the Clare's to make them smaller with no thumbs. Willow likes borrowing Clare's. Oh well. I've been trying to use up a bunch of yarn from my stash and have designed several new hats so I'll have to coerce my model soon (preschoolers can be quite finicky about such things) and post patterns. Nothing fancy but still fun - a lacy swirl, a tricorner pompom hat, and kitty ears. Making yogurt at home is so easy. YOU DON'T NEED A YOGURT MAKER! That machine was invented as a solution looking for a problem in my opinion. 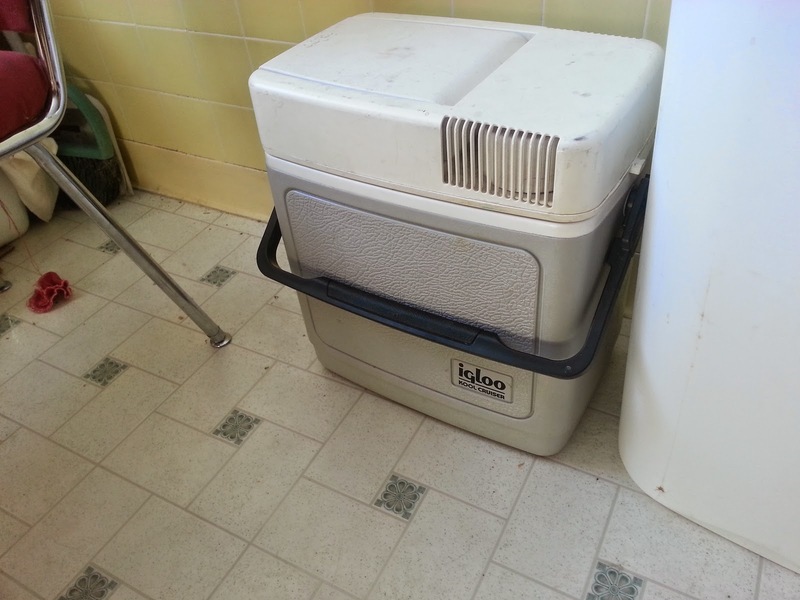 A cooler works just fine. I thought I'd post the process to encourage people to give it a try. 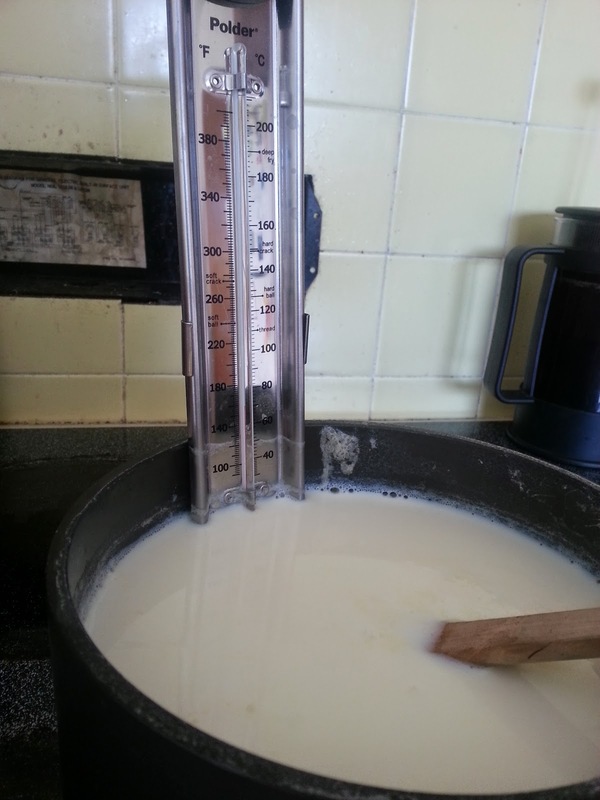 When we used to make yogurt with store bought skim or 1%, it was helpful to let the yogurt drain on some cheesecloth until the desired consistency was reached. It can be quite runny to start with. (The drained liquid can be added as the liquid when baking or to any soup, etc. so the excellent nutrition it contains isn't wasted. It imparts no noticeable flavor.) You can also drain yogurt to the point that it's spreadable like a soft cheese (hence, "yo-cheese") and put it on crackers. Now that we're using whole milk (starts out raw but the process pasteurizes it) it's a perfect, thick rich consistency without any additional steps. Plain yogurt is an awesome addition to savory foods, especially ones with strong or spicy flavor. It can be used like sour cream on Mexican dishes. Indian foods (like daal) are made even better when paired with it. The other night, I made curried cauliflower, mixed it with pan fried spicy sausage and threw in a little bit of cooked kale and onion as well. The yogurt was the perfect condiment to bring it all together. It starts with putting your milk on the stove top. Either very low (my preferred temp, takes longer but I can wander away for a while) or slightly less low with constant stirring to prevent scorching. I don't think hotter saves any time since you're dissipating heat with stirring. A double boiler is also an option but that sounds like more work than I'm willing to do. You want the milk to get to 185 degrees F.
The next step is removing it from heat and waiting it to cool to 112 degrees F. It's got to be this cool so your culture isn't cooked and killed as soon as it is added. 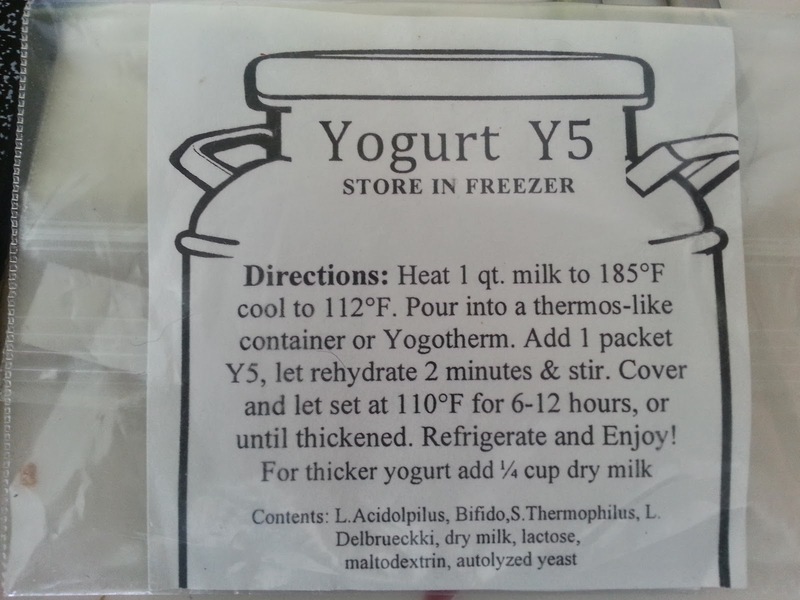 I've been using Y5 powdered culture (available online or from brew stores) lately but you can use a tablespoon or so of any yogurt that advertises active cultures. This packet says it works for 1 qt. of milk. I've done 2 qts. with no noticeable difference in success. 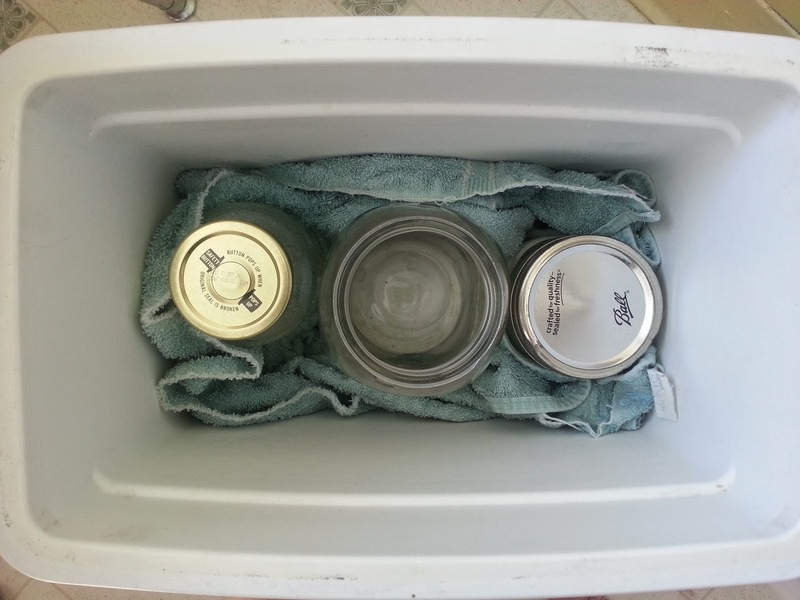 While I'm waiting for the milk to cool, I arrange canning jars in a towel in the cooler. I pour boiling water from the kettle into the two outside jars and screw on lids, closing the cooler to keep the heat in. Depending on the configuration and size of your cooler, organize the jars so they fill the bottom of the cooler and the yogurt is as central as possible. When the milk reaches the right temperature, add your culture, allow it to sit a couple minutes, stir, and pour into the waiting cooler jar. Screw a lid on to the yogurt jar and replace the cooler lid. Let the yogurt sit, undisturbed for 6-12 hours. I always let it go to the long end if I've used lots of milk to my amount of culture. You can open the cooler at 6 hours and gently tilt the jar to see if you've got a set. If it still acts like milk, just put it back in and wait. 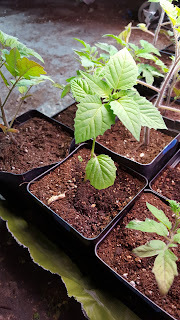 Save a little from the previous batch as the starter culture for the next batch. You may notice that it gets more sour over time. If that happens, just buy a new carton of yogurt (or another packet of culture) to get a fresh start. If you're a regular yogurt eater, I strongly urge you to give this a try. It can be a very economical (and environmentally friendly) alternative to buying carton after carton at the store. 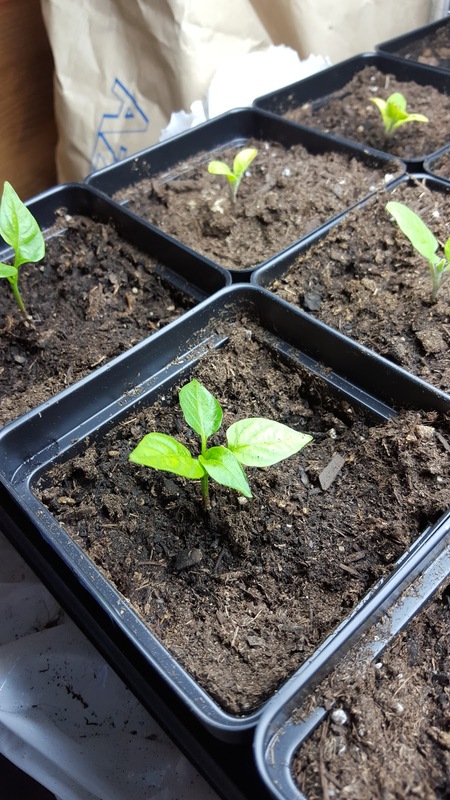 This worked well last winter and it is a nice convenience food for a quick meal. To use the frozen slices, place them on a baking pan in a hot (400-425F?) to crisp/thaw them for a few minutes. Add a dab of sauce and grated mozzarella and broil. 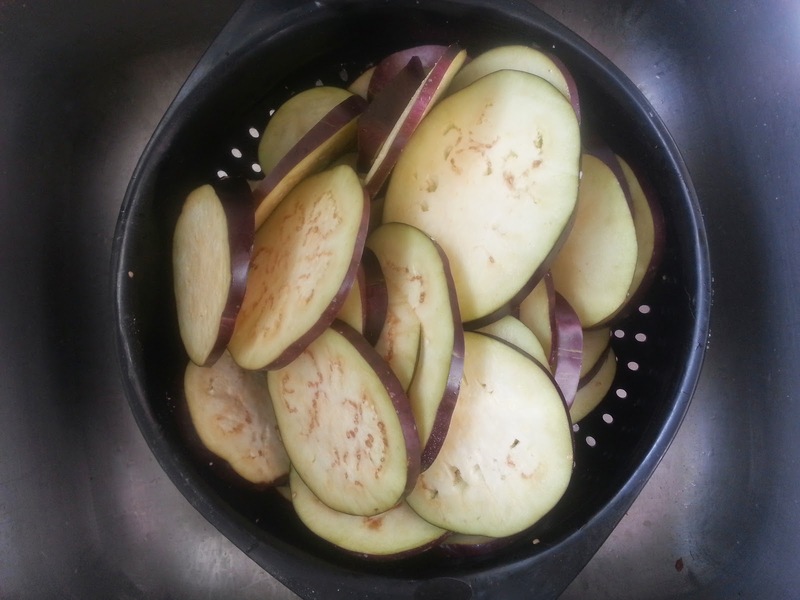 Lightly salt the sliced eggplant and let it sit in a colander to drain for about half an hour. 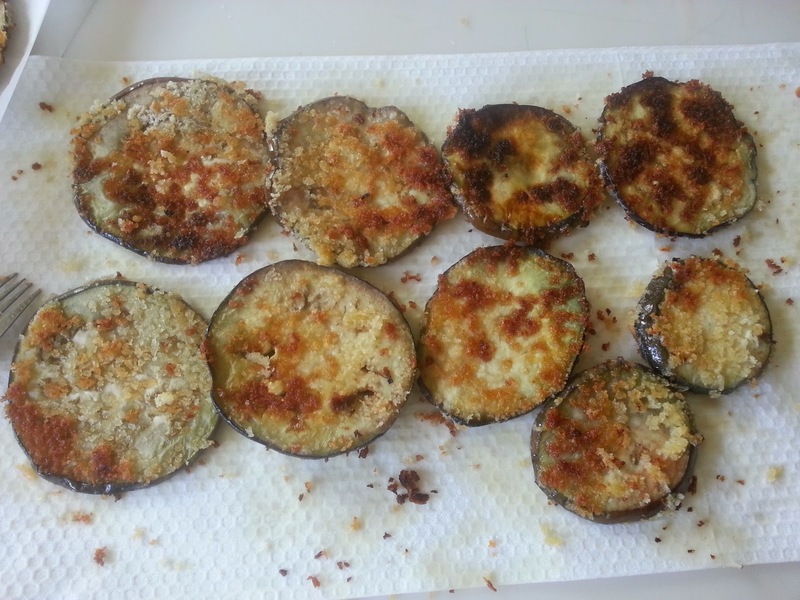 Dip each slice in egg and bread crumbs (we like panko style crumbs). Cool on paper towel and pat oil from the top as well. 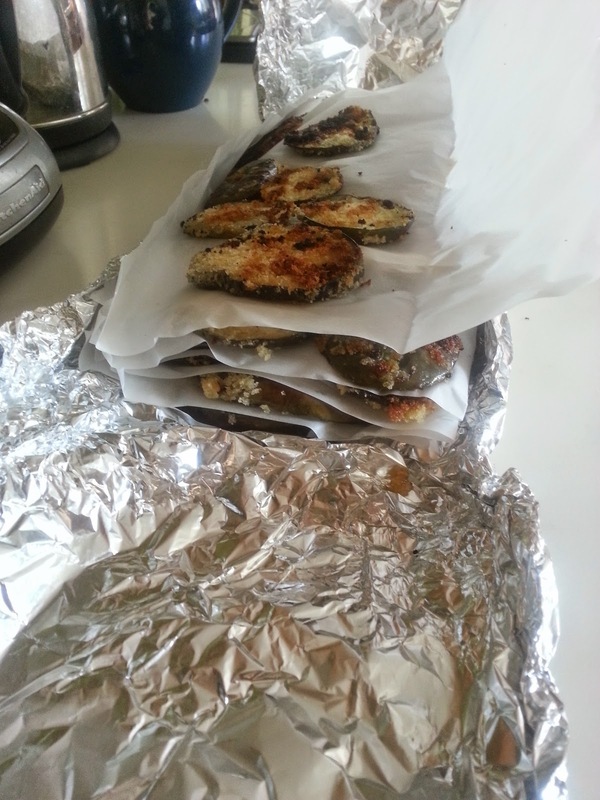 Stack in layers separated by parchment paper. 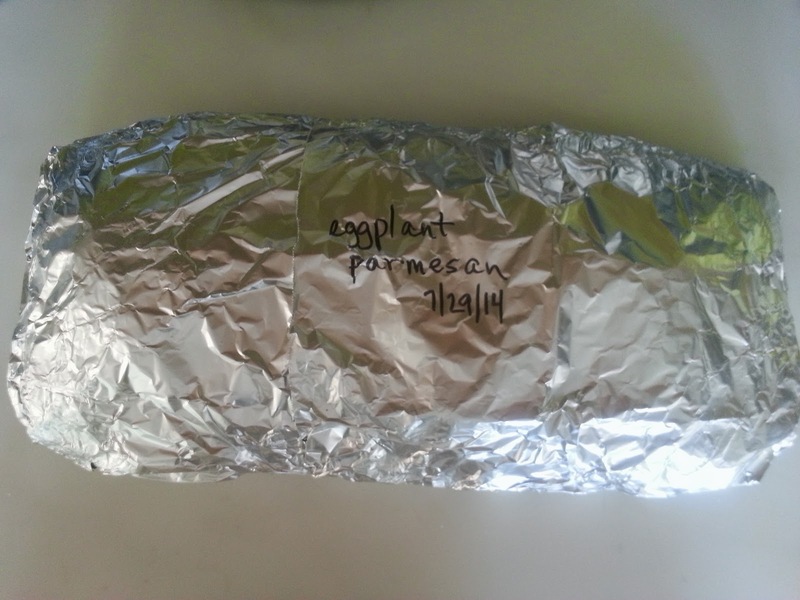 Wrap in foil, label, and place flat in the freezer. 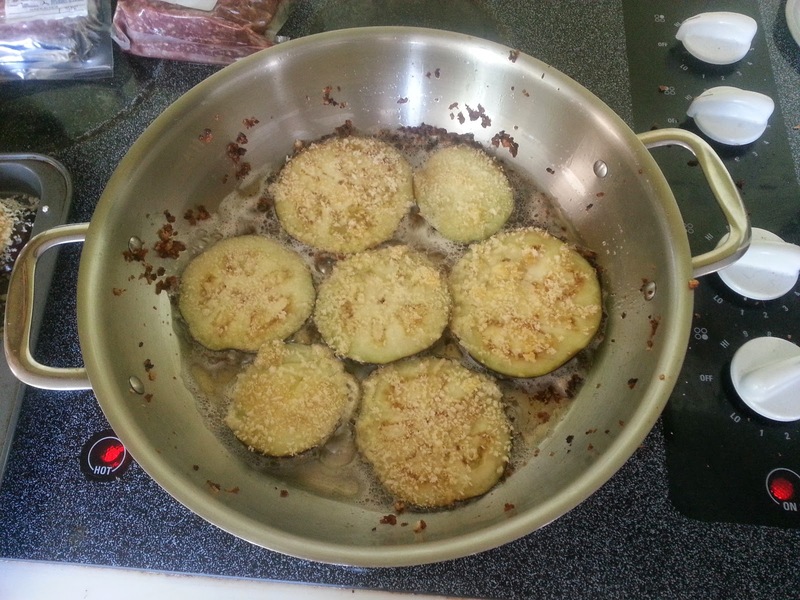 Three large eggplants took two hours (including draining time) to prepare and made 2-3 meals (plus my lunch) for our family. I also used our produce to put together our 4th quart of lactofermented pickles, grated other eggplants for dinner tomorrow, and made ground beef/onion/pepper(Anaheim and Poblano)/garlic/kale enchilada filling for tonight's dinner and for freezing. It feels good to start squirreling food away for the winter. This recipe was my jumping off place. I quit using the grape leaves and haven't noticed a difference. We've been using a couple cloves of garlic, a few peppercorns, some dill head, and some prepared horseradish (Thanks Aunt Debbie and Brad!) 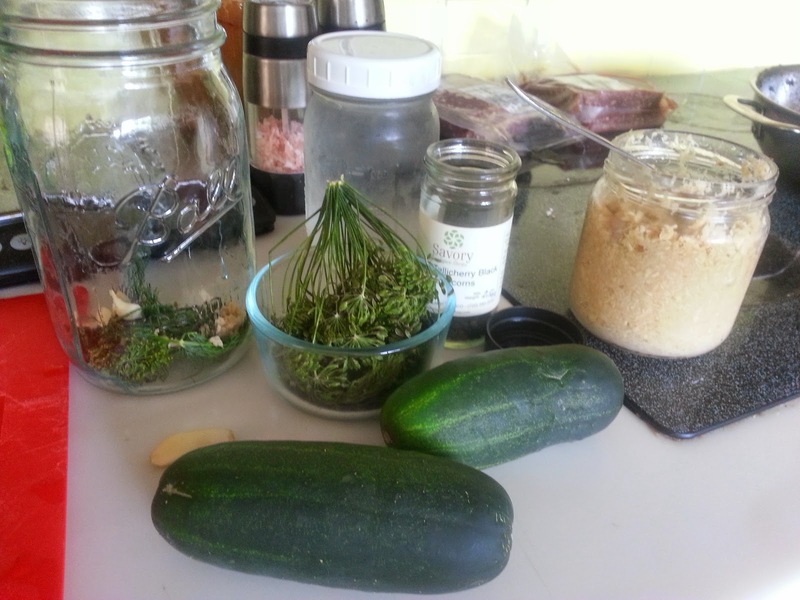 in with the cucumber slices in the brine. Horseradish does seem to be the magic ingredient. I'm looking forward to some jalapenos ripening so we can try that too. Wrap the filling in corn tortillas with some shredded cheese, pour enchilada sauce over the pan (we like Nanita's), sprinkle with more cheese and bake until hot and cheese is starting to crust. 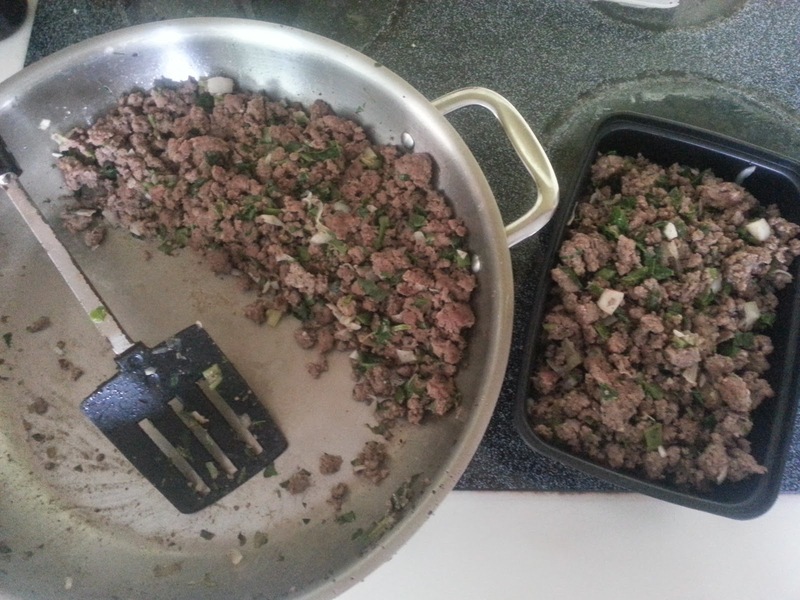 With the filling already made and frozen, it becomes a pretty quick meal.